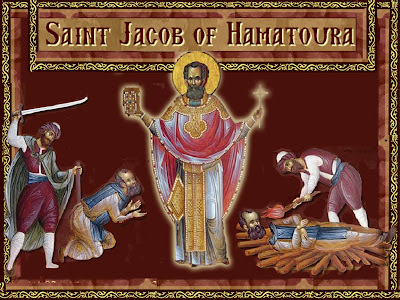 I thought I would share the life of St. Jacob of Hamatoura, whose story and icons I came across at http://www.hamatoura.com/, and whose feast is celebrated in a few days (October 13th). His inspiring story is that of a wondrous hieromartyr of our Church who went forgotten for so long by men, but was never forgotten by God. His memory has been renewed, and he continues to work miracles. "Late in the 13th century, at Our Lady Monastery in Hamatoura, Saint Jacob began his ascetic life. Later, when the monastery was destroyed by the Mamelukes*, he reestablished monasticism along the perimeter of the ruined monastery. In time, he rebuilt the monastery, regenerating and giving renewed vigor to monastic life in the area. His spiritual briskness, vivacity, and popularity among believers drew the attention of the Mamelukes who set their minds to stop his verve and determination and force him to convert to Islam. He [adamantly] refused their relentless pressures. When the Mamelukes' horrible coercive attempts failed, they dragged Saint Jacob, along with a number of monks and laymen, from Saint George's Monastery, situated atop Mount Hamatoura, to Tripoli City (the capital of Northern Lebanon) and handed him to the wali (ruler). For almost a year, he endured tremendous tortures. Nevertheless, he did not give in or renounce his faith despite receiving both adulations and threats from the Mamelukes. Although intimidated by [the uncompromising] Saint Jacob [and his] persistence, finally, as was their custom in punishing their enemies, on October 13th, Saint Jacob was beheaded. In addition, the Mamelukes burned his body to ensure the Church will not give him an honorable burial as a martyr, a burial befitting a saint. Not long after his death, seeing his sufferings and steadfast faith, our Lord bestowed on him everlasting crowns and graces and today he shines as a martyr as much as he was a beacon during his earthly life; at this time the Church announced Saint Jacob's holiness and added him to her list of honored Martyr Saints and prayed for his intercession. Our Saint was almost forgotten in the course of history. This was due to the severe sufferings of the Church under various Moslem sultanates that both weakened Christian spiritual life and resulted in a noticeable drop of Christian literacy. Additionally, all manuscripts and data that could have been sent and translated abroad were either forgotten, lost, or destroyed. However, recorded encounters by the Monastery's pilgrims, upon seeing visions of Saint Jacob, and many others, who sensed his presence, affirmed and authenticated his sainthood. Glorifying the name of Lord, Saint Jacob also healed many. We have recently discovered a clear mention of Saint Jacob in a manuscript preserved at the Balamand Monastery in a Gerontikon, a hagiography or compilation of biographical short stories of the lives of holy saints. In a Balamand archival manuscript, numbered 149, it clearly indicates that the Church commemorates his memory on October 13th. The Monastery of the Dormition of the Theotokos - Kousba, Hamatoura, in Lebanon, commemorated his memory, for the first time, on October 13th, 2002, in an all-night prayer vigil (agrypnia). A number of priests, deacons, and believers participated in that memorable day, as the attendees chanted Saint Jacob's troparion and Akolouthia [service], prepared and edited by the monastery's monks. Today, believers and pilgrims are constantly reporting his apparitions, miraculous healings and other Grace-filled deeds. 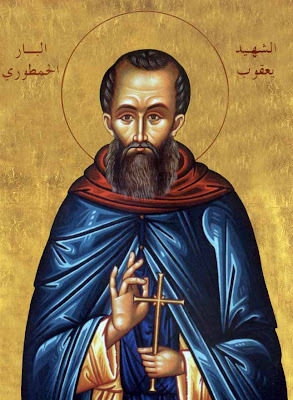 All of this kindled the spiritual fervorness to celebrate the memory of this Saint and give Praise to the Lord, while honoring Saint Jacob of Hamatoura who is still living among us in his monastery performing miraculous deeds, calls, and visitations to believers. "Saint Jacob of Hamatoura was mentioned in the Antiochian Hagiography briefly in a Balamand manuscript (# 149) on October 13th, but the saint was long forgotten because the local documents were replaced by translations from greek neglecting the local saints. He has always been present with the faithful: appearing to some and blessing them, healing others, and he has repeatedly been heard, by monks and visitors, chanting in the church encoraging them go deeper in their spiritual lives. He even asked a faithful woman once to inform the monks that he will show them his grave but they disregarded the subject. On July 3rd, 2008 while renewing the church floor, human bones were found buried in the chapel with a little grave containing two human skeletons, showing marks of torture and beating, some coagulated blood and some liquid blood on the skull. They also found a part of a 3 year old child's skull with some of his bones, and 2 other skeletons, according to modern laboratory testing conducted by Naji Saaiby M.D. specialized in legal medicine, date 650 years. One of these last two skeletons shows marks of fire, he was also decapitated and his second neck vertebra was lost, what implies according to the criteria of the Balamand manuscript that it is Saint Jacob's skeleton who was in his fifties when he was killed, his companion was in his fourties, as for the rest of the skeletons they date to 450 years ago. The ancients considered these relics holy, since they did not bury them in common graves, but in the middle of the church, and in a hastened wayas a result of pressures and persecutions. Under the Holy Table, were found the some parts of a child's skull, therefore the ancients considered them martyrs. The church was reconsacrated on October 16, 1894 (114 years ago) because it was vandalized. A large number of the faithful visit teh monastery and are blessed by the prayers of the Holy Theotokos and Saint Jacob of Hamatoura. 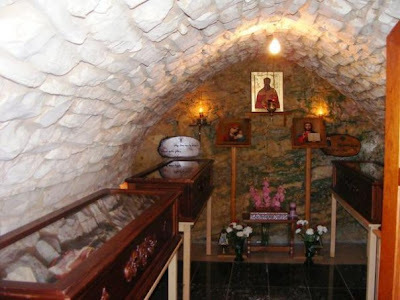 After the blessing Metropoliton George of Byblos and Botrys, the Orthodox can add to their prayers the phrase: "The Fathers Martyrs of Hamatoura", whose relics were found in the monastery chapel. 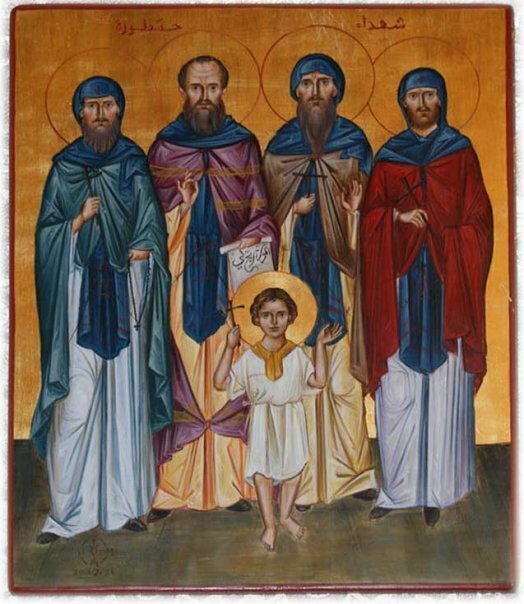 In addition to Saint Jacob, they will be commemorated on July 3rd the date of the finding of their Holy relics." The Holy Relics of St. Jacob the Hieromartyr and those with him have recently been found during excavations in the Monastery. For a short video depicting their procession, see: http://www.youtube.com/watch?v=MiyICApc3Kw&feature=related. 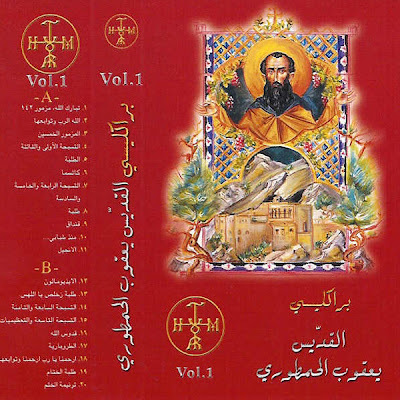 For the Paraklesis to St. Jacob the Hieromartyr of Hamatoura, see: http://www.youtube.com/watch?v=ysiHJkG4YZI, http://orthodoxnotes.com/byzantine-music/28/album. 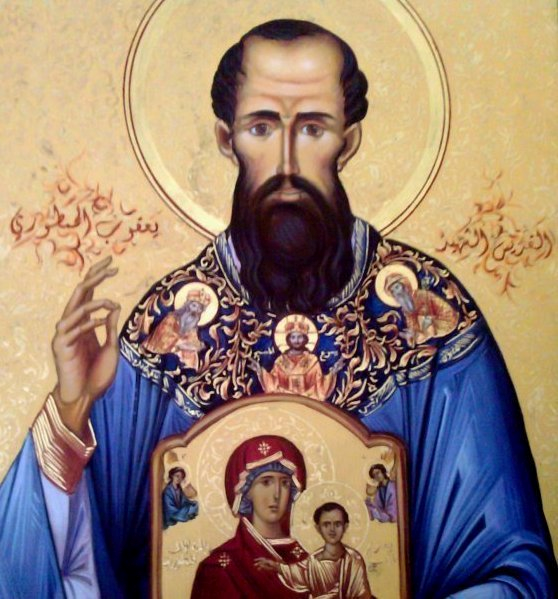 Apolytikion of St. Jacob of Hamatoura - 3rd Mode "Thy Confession of the true divine faith..."
As a cedar of Lebanon groweth * without fear of martyrdom and death, * thou didst become a victor, O Father Jacob. * Thou didst conquer death in thy body * when by humility thou didst control the passions * and when thou wast burnt like incense as a sacrifice. * Intercede with Christ to grant us great mercy. مثل أرزة لبنان تنمو، غير هياب موت الشهادة ، هكذا غدوت يا يعقوب منتصرا،إذ غلبت الموت في جسدك ، حينما ضبطت الأهواء بتواضعك، وباشتعالك كالبخور ذبيحة ، تشفع الى المسيح الاله ، ان يمنحنا الرحمة العظمى . قد نسكت في حمطورة بقلب نقي، وانسلخت عن العالم وملاذه ، يا يعقوب البار الكلي الغبطة، لكن بما حبك متّقد بدت سيرتك للحسّاد تحديا، فصرت تصرخ الى المسيح : تعال يا سيد وخذني اليك . + إفرح يا يعقوب لانك بالنعمة برزت ، إفرح يا يعقوب لانك ألمع من الملائكة . +افرح لانك بالجهاد نلت اكاليل ،إفرح لانك بموتك نلت لحياة . +إفرح لانك ابرزت نفسا ألماسية،إفرح لانك أوضحت عزما غير متزعزع. +افرح لانك بالتواضع حفظت نفسك،إفرح لانك اقتنيت سيرة مرضية لله . +إفرح لانك بالتسبيح القويم اقتفيت أثر الآباء، إفرح لانك صرت في سحابة الشهود . May St. Jacob intercede for us! 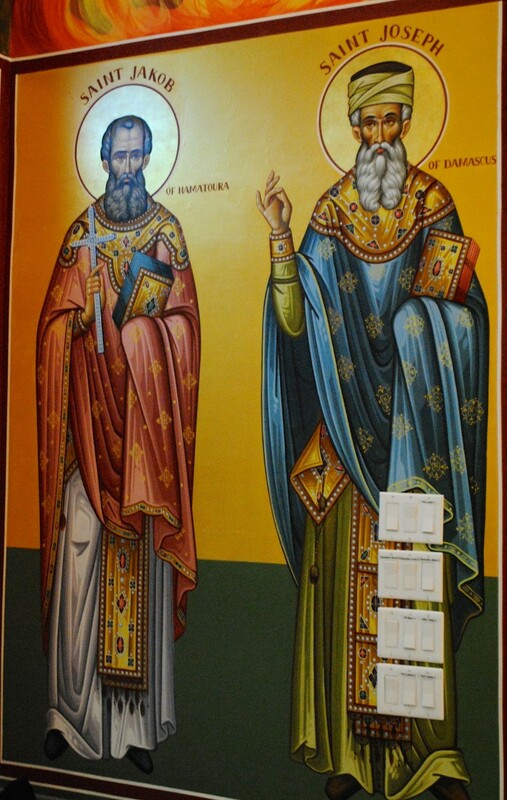 Big thanks to you, but the link to Apolytikion of St. Jacob of Hamatoura is broken. The link is fixed. Thank you for the post. 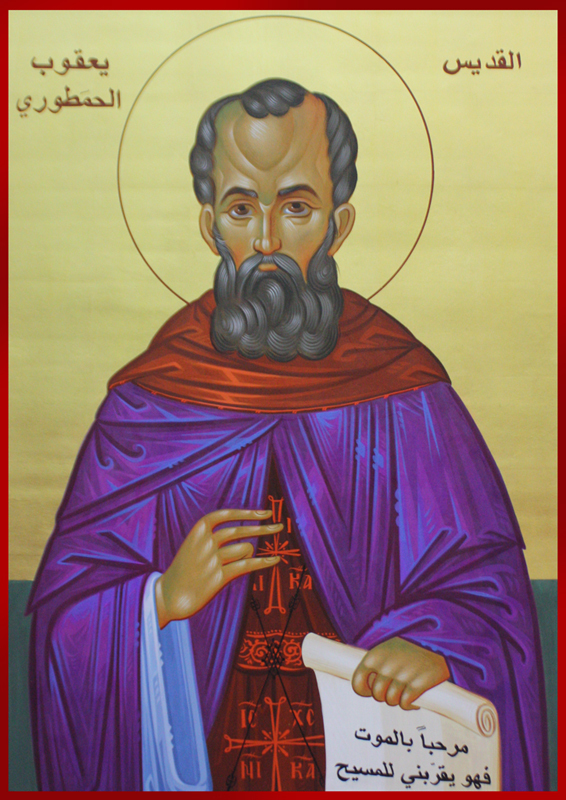 Next Sunday, October 23, the Feast of our holy father Jacob, brother of God and first bishop of Jerusalem, we set forth the holy relic of St Jacob of Hamatoura which has just been authenticated by our bishop, +Joseph (al-Zehlaoui), of the Antiochian Orthodox Christian Diocese of Los Angeles and the West. We would like to know if there are any other parishes or monasteries in the USA which have relics of the saint. Much gratitude to Elder Panteleimon of the Monastery of our Lady at Hamatoura for his entrusting a relic of the martyr to us (Dec 2009)! I was blessed to visit Hamatoura monastery in October last year (earlier than his feast, sadly), and learnt a great deal about St Jacob from a monk there who took me on a tour and to the relics of St Jacob and other saints.